Snakes have been considered sacred in Greece and the Balkans, as well as other cultures, since at least 7000 BCE. They are symbols of rebirth and regeneration, as they travel between our world and the world below, disappear and re-emerge from the earth in spring, and shed their skins in seasonal renewal. 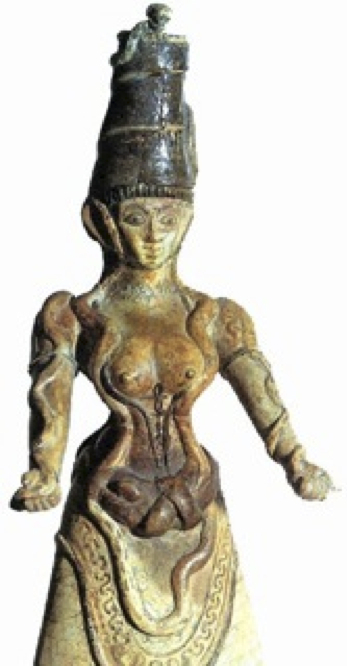 The Cretan Snake Goddess from Knossos (ca 1600 BCE) stands serenely with serpents wrapped around her body, showing how snakes were considered benevolent and were revered, not feared. Snakes are also powerful symbols of healing. Recently, I had an extraordinary experience of ‘serpent healing’ after a serious injury. Friends of mine run a yoga retreat centre in Mani, Greece, called The Spirit of Life, where their son keeps a number of snakes including a beautiful Royal Python named Monty. Monty and I have met on several occasions over the years, and whenever I have spent time holding him, I have felt a sense of great peace and calm. More than that, Monty has shown an uncanny ability to move directly to places of tension in my shoulders, and to gently yet firmly massage sore muscles in a soothing way. Therefore, on a recent visit, I decided to let Monty go wherever he wanted, just to see where he might choose to move. I had had quite a bad fall from my bicycle several weeks before, resulting in multiple injuries, to my back and to my right elbow, hand, rib, shoulder, calf and foot. First Monty went straight to my right elbow and spent quite a long time circling around it. Next Monty wrapped himself around my right hand for several minutes. and fully embraced my right lower leg. He stayed here for at least twenty minutes. Next Monty spent half an hour attending to my right foot and ankle, where he was very active, circling and massaging the whole ankle and foot. Monty continued with long visits to the ribs, shoulder and upper back. All of the places he gave his attention to were the exact places where I had been injured. After more than two hours together, I seemed to feel him inform me that the healing session was over. He curled up into his usual ball shape and appeared to go to sleep. I felt very well afterwards, and since that day I have been remarkably free of much of the pain which had lingered since my accident. I am calling Monty’s healing technique Ophiotherapia, from Ophis, the ancient Greek word for serpent. I find it interesting that Monty paid no attention at all to the uninjured parts of my body. My partner Kostantis’ theory is that injured areas, which tend to be inflamed, are just a tiny bit warmer than surrounding areas, and therefore might appeal to a warmth-seeking snake. But it doesn’t really matter. Whatever the reason for Monty’s attention to my injuries, I found his presence to be tremendously helpful. We know that in ancient Greece, snakes were kept in temples for purposes of ceremony, healing and divination; in temples to Asclepius, the deity of healing, seekers slept a healing sleep in chambers where snakes moved around freely. Numerous archaeological finds show priestesses holding sacred snakes, like the feature image. My own theory about this priestess’ tall headgear is that the snakes would have been taken from their cool homes in a torpid, nonmoving state, and placed inside the conical headdress. The heat of the priestess’s movements throughout the ceremony – in my imagination, particularly through dance – would eventually warm the snake and inspire it to awaken, emerge and move around the priestess’s body as depicted on this and similar votive figures. I tried this once on a previous visit when we placed a sleeping Monty atop my hat while I was drinking tea with his caretakers…but he continued to snooze quite peacefully on my head. I guess he did not feel like moving around that day. Next time I shall try dancing. Mani is a remote area of the southern Peloponnese, the closest part of the Greek mainland to the western tip of Crete. Christianity was established very late in Mani, after the twelfth century, and many archaic, pre-Christian customs remain, including the use of the serpent motif as a symbol of protection for the home, as seen on this 17th-C ceramic tile from Kardamyli. My wise friend Niki, now in her seventies, keeps the old custom of welcoming and feeding a ‘house snake.’ It’s a wild snake, which visits daily; Niki gives it a bowl of fresh goat milk on her doorstep, and the snake sheds its skin by her door in exchange. Many herb women in Mani use shed snake skins for medicinal purposes. Both the spiral and the serpent symbolises life leading into death and again into life – the journey of healing and transformation. This has been my journey too, at numerous times in my life, and again since my recent accident. I have had to go within, to a place of literal stillness, when at first it was not possible to walk at all, and then I could only walk with considerable pain and difficulty. After my serpent-healing session, I could walk without pain for the first time in two months. I am very grateful to Monty and his ancient gift, which helped bring me out of the still centre and back into the movement of life. My heartfelt thanks to Monty and his devoted caretakers – and to our ancestors in ceremony, dance and animal communication who have left so many inspiring traces for us to follow. 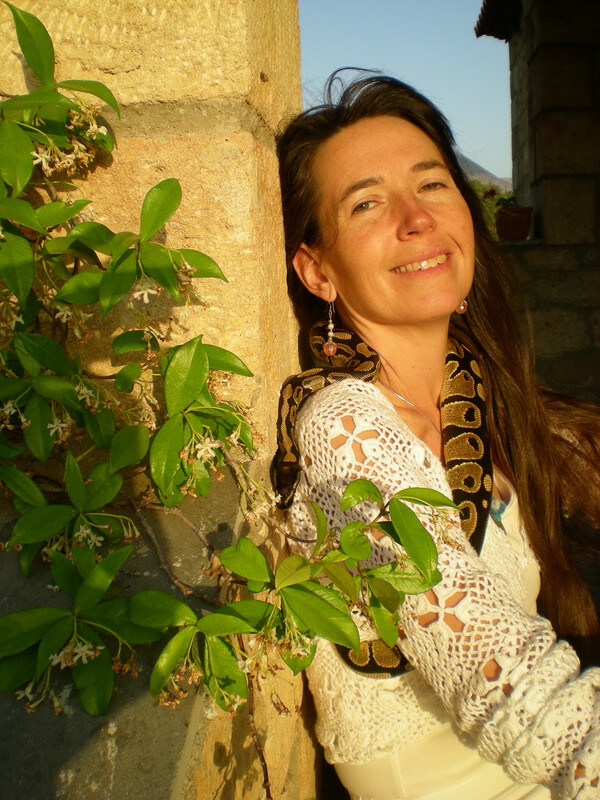 Thanks also to Carol Christ for bringing me close to the ancient serpent goddesses on her Goddess Pilgrimage to Crete (www.goddessariadne.org) and for encouraging me to write about my experience of serpent healing. Laura Shannon has been researching and teaching traditional women’s ritual dances since 1987. She is considered one of the ‘grandmothers’ of the worldwide Sacred / Circle Dance movement and gives workshops regularly in over twenty countries worldwide. 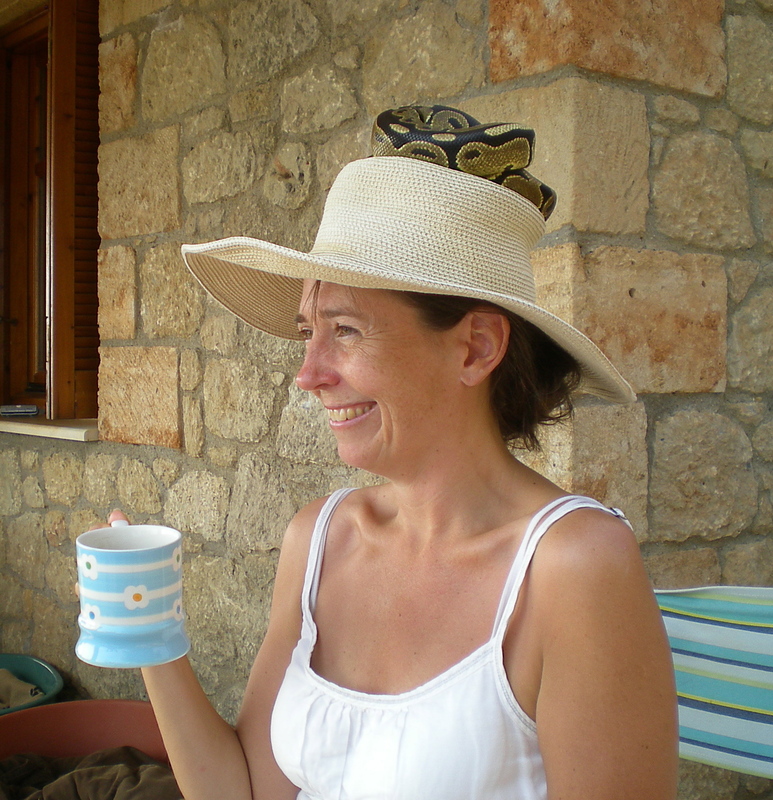 Laura holds an honours degree in Intercultural Studies (1986) and a diploma in Dance Movement Therapy (1990). She has also dedicated much time to primary research in Balkan and Greek villages, learning songs, dances, rituals and textile patterns which have been passed down for many generations, and which embody an age-old worldview of sustainability, community, and reverence for the earth. Laura’s essay ‘Women’s Ritual Dances: An Ancient Source of Healing in Our Times’, was published in Dancing on the Earth. As a feminist art historian, I have a great love of ancient Greek pottery, the Hymn to Demeter and the exquisite wall frescoes in Crete. But the statues of serpent goddesses/priestesses were too alien for my understanding. Thank you so much, Laura, for helping to close that gap in my love for all creatures under heaven, by way of this outstanding contribution to FAR!! Sarah, I understand you completely, as the serpent goddess figures also seemed very strange to me when I first encountered them so many decades ago. As is so often the case, experience created the bridge to understanding. The physical and soul experience of Monty’s presence, his simply knowing what to do to help, overcame all of my intellectual questions, doubts and fears. It felt so right. I remain very deeply touched by the encounter. Thank you I enjoyed this healing story. The Ouroboros may be of interest to you too … the snake that bites its own tail .. Such a deep experience, thanks a lot for sharing this with us, dear Laura. For me it is also a wonderfull sign, how enligtened the nature in all their forms of beeing is..
I´m so thankfull to monty, that he gave you so much attention, unconditional love and devotion, that your selfhealing process works so deep and liberated you from pain. And thank you also for sharing all the ancient roots of healing through snakes in Greece. It a great gift for me to know about this yet. love and blessings for you, dear Laura. Thank you and thank Monty! Gorgeous post! BTW The narrative character of The Maeve Chronicles has an intimate initiatory encounter with snakes in Magdalen Rising should any snake lovers wish to check it out. Thank you for this post. Monty is gorgeous. Sociological studies have shown that old people in nursing homes do much better in respect to their health and cognitive function if they are given access to birds, cats, and dogs. There is also a program in the USA to send ‘comfort’ dogs to communities where there have been shootings or other forms of violence. The dogs walk through the town hall and people pet them. Yes, the snake was probably attracted to the sites of active inflammation on your body, but scientists still have yet to understand why physical contact with animals elicits such positive powerful psychological and physiological effects in humans. This is an interesting line of inquiry, especially in its potential connection to rhythms of dance. Do you know if ‘non-alpha dominant snakes’ tend to be one gender or the other? My living experience is with boa constrictors mostly and a cobra. My handling experience is with corns, hog noses, garter, burmese and ball pythons. Out of these, cobras are alpha dominant. Gender for non-alpha dominant snakes is a matter of degrees with, females sometimes being more assertive than males due to need to eat more, while males may become more assertive during mating season. Assertive (to me) means alert, quicker reactions, holding space rather than being aggressive. Cobras are extremely assertive, with their energy matching their image of the Kundalini rising. Mambas are considered aggressive. I am overjoyed to read of your experience and even further to know that there is a ‘Snake Healing Temple’ (adjunct tho it may be) to the yoga retreat center in Greece! It’s now on my bucket list to visit. When I was in Crete in 2004, we hiked into Lissos, one of the Asceplian sanctuaries and I couldn’t find even a shed snake skin. Further, when we were visiting around Delphi area, I found a snake that had been cut in half!! A picture later determined it wasn’t a venomous species. You will love dancing with Monty as one of his many gifts will be the movement signature of “choreography within the improvised phrase”. My beloved Snake teachers have danced with me for years publicly & privately. I look forward to reading what you learn when you both collaborate in one of the ancient dances! Thank you for sharing your personal experience and adding in Serpent symbolism & metaphor. It is a deeply embedded archetype within our bodies & psyche that yearns to be re-membered and activated. I fully agree with your theory of the conical headdress as it’s a given today when working with snakes: entraining them biologically (temp) and environmentally (darkness) as a solicitation to be held by us. This was such a beautiful confirmation of my sense that contact with the snake was inherently healing. I am so glad to know that you and others are working consciously with the power to heal which Monty and I intuitively discovered. This was my image of the sleepers in the Asklepion where snakes wandered freely – that they would come into healing contact with the bodies of those asleep in their realm and needing healing. Thank you! Thanks so much for sharing this wonderful healing experience with Monte the snake. I would also love to visit the Snake Healing Temple. Fascinating! I’m also intrigued by how snakes relate to the Minoan/Greek oracular tradition, possibly through the ingestion of their venom. Theresa Dintino’s novel “Ode to Minoa” explores this topic beautifully. I don’t know about the use of venom as an oracular hallucinogen, but it would not surprise me. We do know that the behaviour of snakes was seen as a portent on many occasions. Marion Zimmer Bradley’s book about Cassandra of Troy (The Firebrand) also has a lovely thread in it about Cassandra’s training as a priestess involving keeping and raising snakes for purposes of healing and divination. There are no poisonous snakes in Crete and I do not think this was the point, myself. Thank you for this fascinating post, Laura. It’s great to learn that snakes are healers, not just symbols of healing. Exquisite irony in that insight, Nancy!! Exquisite irony and also exquisite hope, as we so often start with a purely symbolic or intellectual approach to these ancient mysteries and then find that our experience confirms and deepens our intuition. Based on my various experiences over all these years in Eastern Europe, I have come to believe that the great healing skills and wisdom traditions from Old Europe are not completely lost. Fascinating post Laura! Thank you! I have had the experience of watching a boa constrictor do a healing on a woman in circle–absolutely mesmerizing! And although no words were spoken, everyone present had no doubt that the woman and the snake went into trance together as the snake did its healing work. Yes, that was my experience also, although I hesitated to name it as such when writing my story: definitely an altered state of awareness with deep knowing, trust, and intuition. It seems that the phenomenon of serpent healing / ophiotherapia is more widely known than I realised, as indeed it deserves to be. I often feel some of my empathetic cats (females) give healing when I’m unwell. One would lie directly on my chest if I had a cough or bad cold. Once during a rolfing session the practitioner’s cat entered the room and sprang up onto the treatment bed and curled up on my back at a strategic point–so I suspect other animals (or at least cats!) also can transmit healing. Of course they were sacred animals in some cultures too, notably ancient Egypt. Laura, it is so fascinating what you write about your encounter with Monty serpent and to see the fotographs is very touching and I can well imagine. Just the days before I had some toy-snakes in my hand and I thought, that I can´t get a connection to these beings. They are so special,strange, unknown for me, incalculable, a bit uncanny. The sharing of your experience suddenly opens a door and also the sharings of all the others in this blog. Thank you so much for the beautiful revelations in your newsletter; first, may I say I am so pleased you are on the road to recovery and preparing for your future circles – I pray it will continue unhindered. Your experience with the snake was wonderful and whereas there could be a prosaic explanation, I feel there is more. This is because I experienced something similar, but not a physiological injury. My heart had been broken, to use a cliche, and I was grieving for a lost relationship in a way which was leading to deep depression when my daughter came out to Spain to visit me. I decided to take her to a safari park in the mountains which cared for rescued pets. There, I was invited to hold the boa constrictor which was out for its constitutional. It was placed around my neck, but was not comfortable and worked down until it was nestled against my heart, cradled in my arms. There, I could feel it pulsing, contracting and relaxing, warm and safe. It did not want to leave when the keeper offered to take it, and even though it was heavy to hold, I knew not to move it. Some half an hour later, I felt it totally relax and loosen its hold, and knew it was ready to leave me. I felt so different – and that day I smiled and laughed with my family, and ate a proper meal. To say I was cured sounds melodramatic, but I knew I was. So, dear Laura, I do believe your meeting with Monty was healing and that there are things in the animal kingdom we cannot understand because they speak a different language and have skills we mere mortals can never achieve…yet we treat them as inferior, and destroy and fear them…how sad!